Learn creative and fun ways to use solar and alternative energy! Join us for local vendors that will present, demonstrate, guide and/or sell their products or inventions to help showcase the eco-friendly facility of Cat Mountain Lodge Bed & Breakfast. 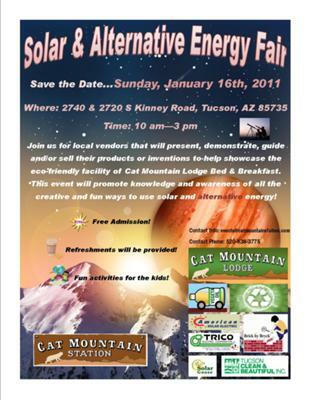 This event will promote knowledge and awareness of all the creative and fun ways to use solar and alternative energy! Thanks for featuring this Fair!